This section is all about Ultima VII: Serpent Isle. It's aim is to host every Ultima VII file and document out there in Internet. Go straight to the Ultima 7 walkthroughs section! So far the site boasts over 40 MB of binary downloads and over 3 MB of online TEXT and HTML documents. NEWS just in! EA games including the Ultima Series will now be available for download @ GOG! 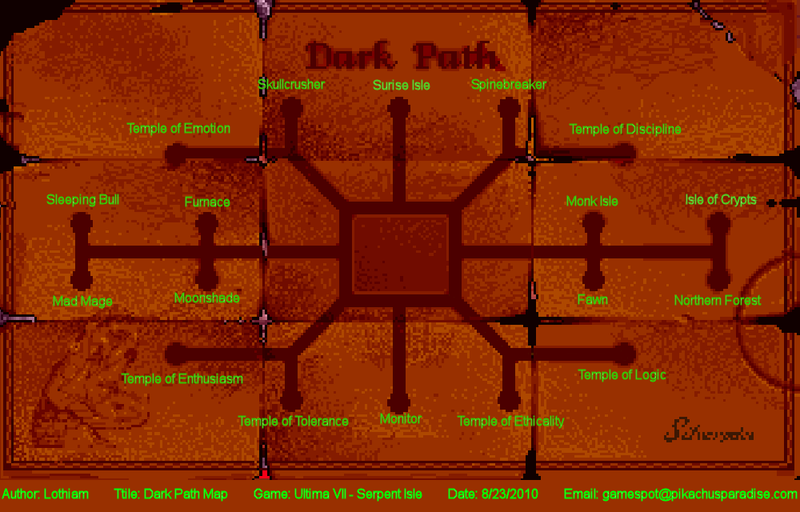 Added Dark Path Map by Lothiam. Serpent Gates layout. Shows you where all the teleport pads lead you to. Play the Ultima VII series in your PSP! See the map of Ultima VII in your browser. Zoom In, Zoom Out with even a 3D view! Updated the Serpent Isle Box Shots with bigger ones. Find it here! Added Hacki's Ultima VII: Serpent Isle Nitpicks. Interesting reading about the holes in the story line. New walkthrough by Lord DCD added. A new way to run Ultima7 under windows has been discovered! Head straight here! A work in progress: Bugs in Ultima VII .. .find some information here!